WILL, the radio station of the University of Illinois at Urbana-Champaign, featured our GIS project in their 21st Show. Shannon McCloud, a participating teacher and a student from her classroom were interviewed. In addition, Jonathan Thayn, Co-PI, and May Jadallah, PI, talked about the project on March 21, 2016. WILL link: The 21st: Can A Turtle Change STEM Education? The Illinois Sustainable Living and Wellness Expo is an annual event in Bloomington-Normal Illinois. Our team set up a booth at the Expo in the spring of 2016 to showcase GIS as an educational tool that can help students explore sustainability and ecology. 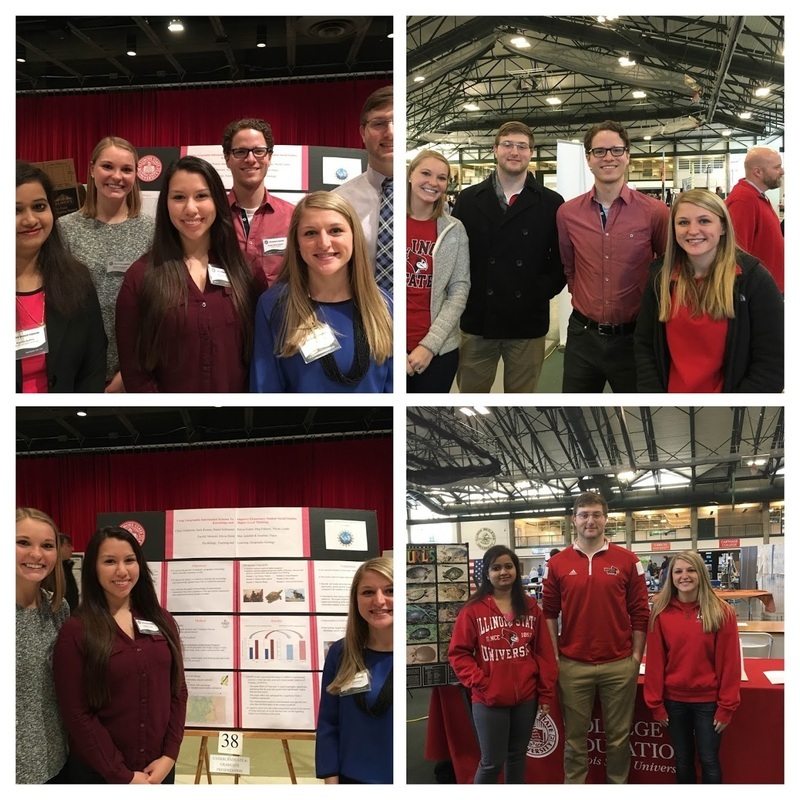 The Illinois State University Research Symposium gives undergraduate and graduate students the opportunity to present research they have completed during the year. This year, students on the GIS Education Team presented a poster titled "Using Geographic Information Systems to Improve Elementary Student Social Studies Knowledge and Higher-Level Thinking." The group, led by undergraduate Psychology major Chloe Lindstrom, also included: Zack Roman (Graduate, Psychology); Daniel Schloesser (Graduate, Psychology); Kavya Gupta (Graduate, Information Technology); Megan Flaherty (Undergraduate, Psychology); and Nicole Landa (Undergraduate, Psychology). More information on this presentation can be found on our Presentations and Publications page. Click on the picture to the right to see the photos from these events. Joel Studebaker and May Jadallah gave a presentation at the University Club entitled Looking Above and Beyond STEM on November 2016.The presentation was attended by ISU former and current faculty. For the second year in a row, NSF created a video hall to showcase innovative work designed to improve STEM education. We created a 3-minute video to describe our project and present its impact. Students and their teachers in two classrooms were featured talking about the GIS curriculum. Our video was the second most discussed presentation in the video hall in 2016. The video below was created by a fifth grade student participant in our project after completing the entire curriculum. Our team gave several presentations at the Principal Investigator (PI) Meeting organized by the Community for the Advancement of Discovery Research in Education (CADRE) both in 2014 and 2016. Here is a link to our work as it is posted there. In addition, the presentations that we gave at these conferences can be seen in our Presentations and Publications page. CADRE is a network for STEM education researchers funded by the National Science Foundation's Discovery Research K-12 (DR K-12) program. Through in-person meetings, a web site, common interest groups, newsletters, and more, CADRE connects these researchers who are endeavoring to improve education in science, technology, engineering and mathematics in, and outside of, our schools (CADRE website).